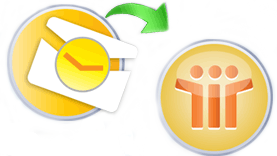 Require a tool for converting Outlook file to Lotus Notes? Converting your Outlook mails, contacts, calendars, journals, etc to Lotus Notes with Outlook to Notes Software. Outlook to Notes provides you the advance utilities to access your Outlook PST file in Lotus Notes. Outlook to Notes easily Transfer Outlook emails, contacts, journals, calendar, tasks, notes to Lotus Notes. It is just like a dream comes true for Outlook User; otherwise it is very troublesome or tedious work to Transfer Outlook to Notes. But with Outlook to Notes, it becomes a child game to Convert Outlook to Lotus Notes. No technical skills are required while working with Convert Outlook to Notes Tool. We have beed launched a variety of Specialized tools and services for the need of Lotus Notes and Outlook Mailbox conversion, Address Book conversion etc. Convert Outlook to Notes tool is an Outlook Mailbox Conversion program that employ to Transfer Outlook to Notes. Users successfully access Converted NSF files via Lotus Notes in NSF file format. A number of easy steps required to Convert Outlook with Notes. Select available Mailbox through drop down list. Select file or folder which you want to convert. Enter NSF file name to access Outlook file data in Lotus Notes NSF file. User Friendly Interface: Smooth navigation, Easy-to-follow, consistent look-and-feel across the application and considerably reduces technical curve is the basic advantage of PST to NSF format. Convert PST to NSF format: First of all, it creates a duplicate copy of PST file and then converts it into NSF file format. Complete accessibility of Outlook items into Lotus Notes : Each and every item of Outlook such as images, attachments, address book, tasks, alarms, to-do list, journals, calendars, appointments, email formatting to Lotus Notes. Support MS Outlook 2000/2002/XP (ANSI format) and Outlook 2003/2007 (Unicode format): Convert Outlook to Lotus Notes supports both, ANSI & Unicode file format at the time of Conversion. Run Smoothly with all version of Windows: Software successfully runs with Windows Vista/2K/XP/2003 & Windows7. Supports both Configured as well as Orphan PST file: Easily holdup Configured as well as Orphan PST file. Download and Try Outlook to Notes Software for FREE: Convert and migrate your Outlook emails, contacts, to-do list etc from configured and orphan PST to NSF.